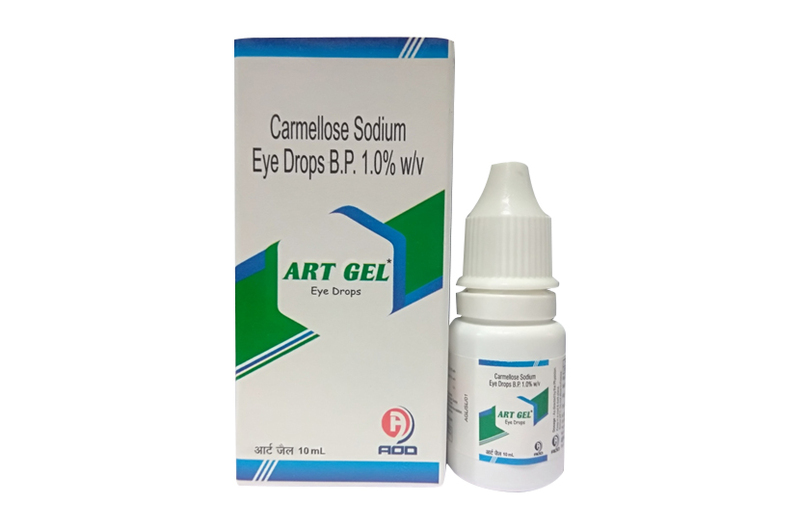 ART GEL - Eye Drops (Carmellose Sodium Eye Drops IP) contain the active ingredient Carmellose Sodium, which is a type of medicine known as an eye lubricant. It is used for the treatment of the symptoms of dry eye (such as soreness, burning, irritation or dryness) caused by your eye not producing enough tears to keep the eye wet. Primary packing - 10 ml white Poly bottles White caps &Nozzles. Secondary Packing - Labels, Cartons, Shrink Pack & Shipper box. 10 ml of solution in white poly bottles with white caps & nozzles in properly sealed. Keep in a cool & dark place. Below 25ºC.Do not allow to Freeze. ART GEL - Eye Drops (Carmellose Sodium Eye Drops IP) has no pharmacological effect. Carboxymethylcellulose Sodium has a high viscosity, resulting in an increased retention time in the eyes. Due to the high molecular weight (approximately 90,000 Daltons), Carboxymethylcellulose Sodium is unlikely to penetrate the cornea. ART GEL - Eye Drops (Carmellose Sodium Eye Drops IP), for temporary relief from burning irritation and discomfort due to dryness of the eye or due to exposure to wind or sun. May also be used as a protectant against further irritation. Hypersensitivity to sodium carboxymethyl cellulose or to any of the excipients. This product may temporarily cause blurred vision right after being placed in the eyes. Do not drive,use machinery or do any activity that requires clear vision until you are sure yu can perform such activities safely. If you experience eye pain, changes in vision, continued redness or irritation of the eye and if the condition worsens or persists for more than 72 hour, discontinue use and consult a doctor. Instill 1 to 2 drops in the affected eyes as needed. ART GEL - Eye Drops (Carmellose Sodium Eye Drops IP), is supplied in one white polethylene Bottle packed with printed labelled & cartons and Such 25 Carton Packed in a Shrink Sleeves & corrugated box. Activation Pending..Just one little step remaining! An email has been sent to your email address to validate your email address. Please click on the link provided in the mail to activate your profile.